GDPR Compliance: How Can HR Departments Respond? Digitization has changed human resources. Easier access to data speeds up HR tasks such as talent management or performance analytics. But under the new EU General Data Protection Regulation (GDPR), you need to protect employee data much more effectively than ever before. Here, we discuss how the it.data guardian solution enables better data quality and can support HR departments with GDPR compliance. What New Challenges Does the GDPR Pose to HR Departments? In HR, administrators deal with highly personal data on a daily basis. This sensitive information, such as addresses, bank details, and even medical records, needs to be kept secure. A disorganized system blurs data overview and can make it difficult to identify where threats to security exist. An additional challenge under the new GDPR is that consent previously established in an employment contract may not still be valid and could require renewed consent from employees. An employee has the right to review the personal data processed by their employer at any time. This demands a high level of data transparency and the ability to produce a personal data report on request. But how can you provide this quickly if your system is overcrowded, outdated, and contains inconsistencies between departments? New principles as part of the GDPR require master data to be accurate, up to date, and complete. HR systems will need to be reviewed to ensure they fulfill these criteria, which can be challenging in cases where data is inputted via multiple sources, from various departments. Inconsistencies might also occur if employees are using self-service software for tasks such as hours worked, holidays, and absences. This could result in multiple versions of the truth across departments and offices, errors, and low data quality. These systems, and the way data is transferred from them into the master HR data processing system, will need to be reviewed to ensure GDPR compliance. With it.data guardian, master data managers can monitor, troubleshoot, and optimize HR master data. The software solution it.data guardian from itelligence is embedded into a company’s master HR data system. Running on the SAP Cloud Platform, the solution is compatible with SAP SuccessFactors software and can work in combination with SAP Fiori. 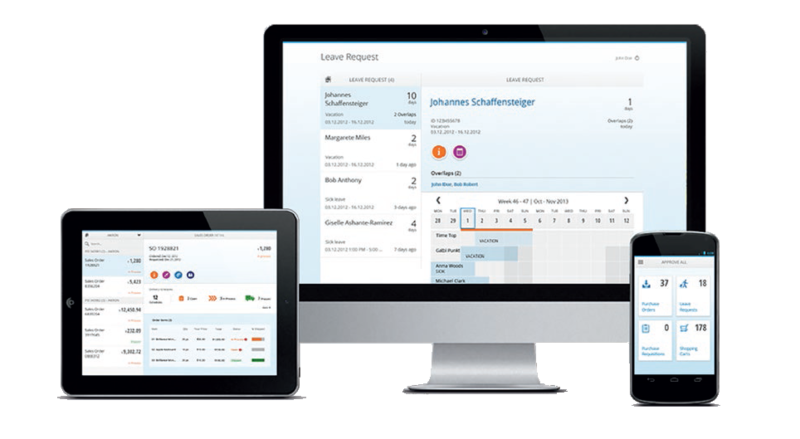 The SAP Fiori launchpad acts as a portal for the user to import and export data. For example, the user can import records from external sources such as legacy systems, SAP SuccessFactors software, or spreadsheets, and export employee data reports. This consolidation of data from multiple sources makes it much easier to confirm alignment across all parties and maintain an overview of all employee information. As it.data guardian can be configured to regularly store information in the cloud, administrators in all departments gain real-time access to data that they can be sure is up to date. Data quality can be assessed via strategic dashboards. Clear visual representation makes it much easier to monitor activities and identify where process breakdowns are occurring or where data cleansing is required. The solution will also include an automated data cleansing function. The company defines rules, and cleansed data can then be transferred back into the master data system. In addition to supporting GDPR compliance, these capabilities enable companies to strengthen their approach to data quality across master data systems. Better transparency and quality of data is an essential part of GDPR compliance. However, the most important aim of the regulation is inherent in its name: data protection. As part of the it.data guardian solution, customers are able to utilize itelligence’s own set of pre-defined rules and security policies or set their own – depending on the licensing they choose. These rules and pre-sets ensure that data inputted into the HR system is compliant not only with company-specific rules but with the GDPR, too. As it.data guardian is a software solution created by itelligence based on the infrastructure of the SAP Cloud Platform, users receive security from two trusted sources. In addition to the integrated security services of the SAP Cloud Platform, any data imported into a system such as via SAP SuccessFactors software or exported into the cloud, must pass through a secure file transfer protocol (SFTP) server. This encrypts data during transit, ensuring utmost protection. Overall, HR departments can rest assured that with the it.data guardian solution, a high level of both data quality and security is maintained. This not only aids GDPR compliance but creates more time for HR departments to concentrate on the personal side of employee management. it.data guardian: itelligence’s software solution is based on more than 15 years of experience within HR.